Former South African captain and one of modern day cricket's best batsmen, AB de Villiers, announced his retirement in May earlier this year. It came as a big blow to the cricketing world as ABD, as he is popularly known, was in the form of his life over the past few years, and he had never looked out of sorts, especially before the vital World Cup in 2019. However, ABD has made himself available to all the T20 leagues in the world. Royal Challengers Bangalore (RCB) will undoubtedly benefit from the young-again ABD, who can give his 100% this IPL season for the Bengaluru side. 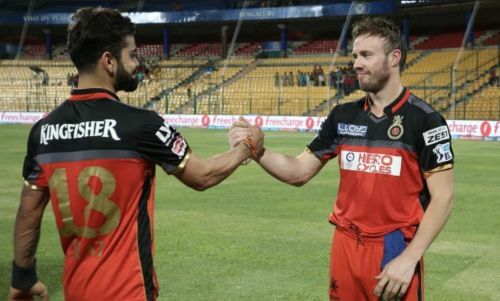 It is a big boost for RCB to have ABD available for the complete season, unlike other teams, who will have crucial players missing the last leg of IPL 2019 due to national commitments ahead of the big World Cup. The Indian cricket team captain, Virat Kohli, has been quite critical and vocal about India’s preparation for the World Cup 2019 scheduled to begin on the 30th of May 2019, one week after the IPL finals (tentative), in England and Wales. Kohli has requested BCCI authorities to manage the workload of all its key players before the World Cup. He has demanded rest in regular intervals for his pacers in IPL 2019 as well. Mohammed Shami wasn’t allowed to bowl more than 15 overs for his side Bengal in the nation's first class tournament, the Ranji Trophy. This initiative by Virat Kohli is certainly worth appreciating as the World Cup should be a top priority for the Indian players this year, and managing the workload of pacers and all-format players should be given utmost importance. With so many items on the plate for Virat Kohli, one thing that shouldn’t be compromised is his IPL side RCB; a team Kohli has been attached to for the last 11 years. Royal Challengers Bangalore had a decent outing in the recently concluded IPL auctions at Jaipur. They seem to have struck the right balance this time around, with many all-rounders who can bat at any position. With de Villiers free from national duty, it would be a wise move if Kohli passes on the baton to ABD only for this particular year. By delegating the responsibilities to ABD, it will give Virat some much needed air to breathe, and he can play freely as a batsman without clouding his mind with making tough decisions for the Bengaluru side. It also gives Kohli an opportunity to manage his workload, and he can take rests in between the tightly-packed Indian Premier League. Kohli could miss games if needed without affecting the team, with ABD at the helm of the affairs. In conclusion, the move will undoubtedly benefit ABD as well, who becomes more dangerous with the captaincy tag. It will help Team India and Virat Kohli, by reducing his stress ahead of the World Cup, and it will benefit RCB as well. It will be interesting to see if the team management proceeds with this approach for this year. IPL 2019: How much the unavailability of players will affect RCB?